Is there a minimal sense of responsibility in European policies towards the people of Turkey, or do we have to content ourselves with European realpolitik? 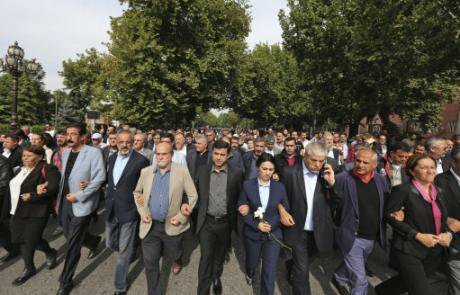 Selahattin Demirtas, centre, and Figen Yuksekdag, to his left, co-leaders of the pro Kurdish Democratic Party of Peoples (HDP) lead a march towards the site of the explosions in Ankara, Turkey, Sunday, Oct. 11, 2015. Burhan Ozbilici/Press Association. All rights reserved.Early on November 4, police raided the homes of the opposition People’s Democratic Party’s (HDP) co-chairs Selahattin Demirtaş and Figen Yüksekdağ on terrorism charges. Along with them nine other MPs were detained, while the HDP headquarters was raided by the police. Facebook, Twitter, YouTube and Whatsapp, now the most reliable sources of news and journalism in Turkey, were restricted or even totally blocked in some provinces of Turkey. The internet was slowed down country-wide. Turkey’s democracy has had many ups and downs in the past. However, given today’s circumstances, it is no longer possible to name it what Collier and Levitsky famously dubbed a ‘democracy with adjectives’. What we see in Turkey today is a de-facto regime change to hyper-Presidentialism and authoritarian consolidation at full speed. Unsurprisingly, international condemnation and warnings about the state of democracy and the rule of law issued by the EU, the Council of Europe and the US fall on deaf ears. The EU’s response has been criticised for forsaking the very values on which the EU was established. It is a legitimate claim: the EU has done almost nothing to discourage or prevent the AKP government from crushing the opposition and dissidents, breaching its constitutional principles, the rule of law and European norms and values. In fact, except for issuing warnings every time a group of journalists or dissidents is arrested, the EU has revived its frozen relations with Turkey through the EU-Turkey refugee deal, upgrading the Turkish government to a ‘key partner’ in managing the refugee crisis. The EU faces an increasingly impudent political authority that does not hesitate to dismantle whatever remains of independent media and civil society, to arrest journalists, activists and elected politicians, and to ‘tame’ the two main opposition parties into ‘docile bodies’ so that they do not intervene in the president’s business. Unsurprisingly, international condemnation and warnings about the state of democracy and the rule of law issued by the EU, the Council of Europe and the US fall on deaf ears. The most recent example has just happened a few days ago following the crackdown on the Cumhuriyet, the best-known and the oldest daily among Turkey’s few remaining independent critical news outlets. Another round of condemnation was made by the European Commission, the German Chancellor, and the European Parliament. They expressed deep concern about the state of democracy and freedom of speech. The President of the European Parliament Martin Schulz wrote on Twitter that the detention of journalists was ‘another red-line crossed against the freedom of expression in Turkey’. The remaining half of society is increasingly perceived as a threat. Often labelled as elites and traitors, they now await being stripped of their rights. Turkish PM Binali Yildirim’s retaliation against the red line comment surprised nobody. As usual, he took refuge in ‘the people’ to warn the EU not to get involved in Turkey’s internal affairs. In his address of the AKP group at the parliament, Yildirim noted ‘Brother, we don't care about your red line. It's the people who draw the red line. What importance does your line have?’ In AKP jargon, the 'people' refers to the tight majority that supported the party in the last elections. The remaining half of society is increasingly perceived as a threat. Often labelled as elites and traitors, they now await being stripped of their rights and being subject to extra-legal treatment. No further EU warning will stop the government from systematic violations of the rule of law and the oppression of free speech. Engaging with Turkey through mutual interests and interdependence is, in principle, a good idea. Yet expecting that the AKP will stop short of destroying Turkey's democracy in its pursuit of power is political blindness at best and cynical interest politics at worst. Can the EU do any better than issuing another statement on the deep concern that the acts and Turkish government cause in Brussels? Is the European Council and the Commission willing to agree on a strategy that seeks to avert evident authoritarian consolidation in the largest candidate country? Is there a minimal sense of responsibility in European policies towards the people of Turkey, or do we have to content ourselves with European realpolitik? By opening accession chapters and promising visa liberalisation in the midst of democratic decline, the EU has effectively given up political conditionality in return for the EU-Turkey refugee deal and readmission agreement. As long as Turkey keeps the 3 million Syrian refugees in the country, the deal goes, the EU will pretend that negotiations continue. As long as Turkey keeps the 3 million Syrian refugees in the country, the deal goes, the EU will pretend that negotiations continue. Since the early 2000s, when Turkey was granted official candidate status, the EU has changed. Long before the eurozone crisis and the Brexit debates, Turkey’s membership prospects were exploited for domestic political gains by both eurosceptic and far right parties as well as by mainstream politicians. The French and Dutch constitutional referendums in 2005 put the project of EU integration and enlargement on hold, effectively halting enlargement. So-called enlargement fatigue and the eurozone crisis have obstructed a long-term vision for the future of EU enlargement. Finally, the Juncker Commission openly acknowledged that there would be no further membership under the term of the current Commission. In short, the possibility of changing the course of democratic reversal in Turkey through accession conditionality is not an option any more. This may lead us to conclude that the EU has actually lost its leverage over Turkey. This, however, is not the case. The EU can still put pressure on Turkey to slow-down or prevent the consolidation of a fully authoritarian regime at its borders. There are three options for the EU to dissuade the government from harassing the opposition and dissidents and to restore at least some basic level of rule of law. The EU can use the economic trade card; it can suspend negotiations indefinitely until the government restores the principles of the rule of law and basic freedoms; and it can issue a Plan B that suspends the EU-Turkey refugee deal, which anyway has severe legal, humanitarian and practical deficits. If the EU decides to re-engage with Turkey, a price will have to be paid, as the AKP response may, initially, be harsh. First, instead of sticking to ineffective condemnations of AKP policies, the EU can focus on how it can project power over the Turkish government. One of these areas is the customs union agreement and the field of trade relations. The EU is an important trade partner for Turkey as well as the largest foreign direct investor in the country. Since the Custom Union agreement came into force in 1995, bilateral trade between the EU and Turkey increased six-fold, while Turkish companies have become part of European production networks. Turkish government and business circles pressed hard in the last few years to push the EU to renegotiate the old Customs Union Agreement. The dialogue finally started in May 2015 with an intention to extend its scope beyond the manufacturing sector to cover services, agriculture and public procurement among other objectives. The reality is that the Turkish government needs expanded access to the nearest and most stable destination for Turkish goods and capital markets for several reasons: to boost the country’s economy, to break the path of stalled mediocre growth of recent years, to recover from deteriorated economic/trade relations with Russia and the Middle East, to alleviate the impact of the EU’s free trade agreements with third countries, especially the potentially negative impact of a possible Transatlantic Trade and Investment Partnership (TTIP), and perhaps most importantly, to maintain the myth of ‘economic stability and growth under the AKP’. The Turkish government had good reasons to be alarmed by the EU’s increasing number of free trade agreements with third countries. Risking being left out in the cold due to high tariffs and customs duties in its trade relations with third countries, economic cooperation and bilateral trade has become a key priority for Turkey. The EU can use future trade relations and economic cooperation as well as the negotiations over the Customs Union Agreement that will officially start in 2017 as a carrot and a stick. This may sound like using the EU’s proverbial soft power, but it probably amounts to a more realist policy of speaking the language that the AKP understands. The Turkish government dismisses calls for changing the anti-terror law in return for visa liberalisation. But it will downscale its rhetoric if competition with other developing countries over prioritised access to the EU single market is at stake. It will downscale its rhetoric if competition with other developing countries over prioritised access to the EU single market is at stake. Many people would question the contribution of free trade agreements to development and a more equitable share of welfare among and within countries. However, if we are concerned about the EU's place in the world and Turkey's democracy, then the EU should make use of its power to remind the AKP government that Turkey, at this moment, needs the EU more than vice versa. Second, the EU can indefinitely suspend Turkey’s official accession process. This might sound like a radical option. Keeping a promise that both sides are not willing to honour will lead nowhere and damages the EU's normative integrity. If the EU suspends its relations with the Turkish government as part of a principled move – making clear that it is not inspired by right-wing populism, but by concern for the Turkish people and their democratic aspirations – the EU can win at least the normative ‘battle’ by upholding values that it claims not only to possess, but to disperse in its external relations. The EU should promise to return back to the official negotiations as soon as the rule of law and freedom of expression are restored in the country. Such an action would put the AKP government’s legitimacy and credibility under pressure. It would also trigger a more realistic debate about the regime change in Turkey and the international response to the new regime. This should, however, be done with a firm statement that the EU does not abandon democratic constituencies in Turkey or end accession negotiations because of religious, ethnic and cultural reasons, but because Turkey’s elected government fails to commit itself to democratic governance. The EU should promise to return back to the official negotiations as soon as the rule of law and freedom of expression are restored in the country. And it should talk to the people of Turkey directly. Only a few years ago, more than 70 per cent of them were in favour of accession to the European Union. Some observers may suggest that proactive policy would further deteriorate the relationship and terminate whatever leverage the EU has in Turkey. The reality, however, is that the AKP’s determination to bring back capital punishment for certain crimes and all talk about taking the membership question to a referendum make the continuation of a membership perspective impossible. Such a referendum will be yet another step away from democracy. The end of Turkey's official candidacy through a national referendum would be a terrible blow to the EU’s enlargement and neighbourhood policy. Of course, there is price to pay here. If the EU suspends official accession negotiations, AKP politicians will upscale EU-bashing at home, blaming Europe as biased and Islamophobic. They are likely to find supporters for these claims in domestic nationalist circles. The government will not hesitate to use the termination of the refugee deal as well. It has already shown little interest and commitment to the humanitarian side of regularising the migrant flow between the EU and Turkey. This brings us to the third potential course of action: suspending the EU-Turkey refugee deal and replacing it with a humanitarian option that meets the norms of international refugee law. Turkey may stop patrolling its borders and indirectly allow a free passage to human smugglers carrying refugees from Turkey to Greece. A rise in the numbers of refugees will definitely be manipulated by far-right actors for electoral gains in France, Netherlands, Germany, Hungary, and Austria to name a few. How credible is the contention that the EU-Turkey deal is an effective measure against humanitarian catastrophe at the EU borders, and that it stops the far-right appeal in Europe, single-handed? The current refugee deal itself has many legal, humanitarian and political loopholes that have made its implementation murky and partial at best. The third report by the European Commission on implementation was released in late September. It noted ‘a slow pace’ of returns from Greece to Turkey (according to the report, the total number of irregular migrants returned to Turkey is over 1,600, a small number compared with the 2.7 million Syrian refugees living in Turkey and the 2,900 people arriving daily between June-September 2015) together with continuing irregular crossings that put ‘additional pressure on the reception facilities on the Greek islands’. How credible is the contention that the EU-Turkey deal is an effective measure against humanitarian catastrophe at the EU borders, and that it stops the far-right appeal in Europe, single-handed? There has been a serious decline in the overall number of illegal crossings from Turkey; yet, closed borders left more than 73,000 refugees stranded in the Western Balkans. Italy has received more than 150,000 refugees from the Mediterranean in 2016. The implementation of other key aspects has only been partially successful. The report notes drawbacks in patrolling the Aegean against human smuggling networks, increasing the search and rescue capacity of FRONTEX. Goals to increase capacities of national asylum offices and appeal authorities have not been met, while the number of asylum and border support experts at the European Asylum Support Office and FRONTEX ‘consistently fall short of needs’. Since the implementation of the EU-Turkey deal has officially started, the Greek Asylum Service and the Appeals Committee are overburdened to the point of standstill. The Appeals Committee in Greece received more than 1000 appeals against decisions on admissibility; the target is to deal with 500 cases a month. The aim is to increase the speed of decision on each applicant’s case. According to international human and refugee rights organisations, this could violate the right of access to a fair and efficient appeal system in case of a negative decision on the applicant's refugee status. Moreover, since the deal is in place, Turkey has resorted to multiple blockings, pushbacks and forced mass returns at the Syrian border. Some reports have revealed that child labour among Syrian refugee children in the textile industry, mistreatment and violence against Syrians, and sexual harassment of refugee women have seen a rampant increase. Evidently, an openly authoritarian and Islamist government in Turkey will not be a trustworthy partner and definitely not a ‘safe third country’ for refugees. Under these conditions, it cannot guard the EU’s borders and save the EU from ‘the trouble’ of irregular migration and refugees. Sooner or later, the EU will have to face criticisms on humanitarian grounds and on the shortcomings of the deal. This is why human rights organisations and some member state politicians have called for an alternative and more humanitarian approach than the '1:1 framework'. According to this framework, the EU resettles a Syrian from Turkey for every Syrian returned to Turkey from the Greek islands. An alternative plan would require genuine intra-EU solidarity with border countries like Greece and Italy as well as scaling up resources for search and rescue and asylum processing capacity of member states in lieu of outsourcing European border security. Yet, it would also mean preventing the Turkish government from the threat directed at the EU, to ‘flood Europe with refugees’. Furthermore, the question of far-right support awaits an answer from mainstream parties on the right and left regardless of the future of the EU-Turkey refugee deal. Whether the agreement will be longterm or not, or whether it prevents irregular migration, far right groups do not need ‘tangible enemies’. In fact, they attack the ideas and values of pluralism and diversity that underpin the united Europe. What is more, the existing migrant communities have long been targeted by radical groups. If far-right politicians need to prove ‘the danger’ to their constituencies, they will indiscriminately point to old migrant communities and recently arriving refugees. With or without the refugee deal with Turkey, the EU and member state leaders are obliged to think about an effective counter-response to the rising far-right appeal in Europe. The refugee deal's termination will not trigger a new wave of migrants coming from Turkey, because a dictatorship cannot live with open borders. Finally, there is another aspect of Turkey's threats to open the borders: Given the current domestic escalation, it is actually a fallacy to suggest that the Turkish government can open its borders to 'flood Europe'. After the purges against hundreds of thousands of people, thousands of Turkish citizens are ready to escape the country. If anything, the AKP government will have to secure its borders to the point of sealing them off completely, in order to prevent critics of the regime from fleeing the country. The AKP's refugee game is a bluff that can easily be exposed. The refugee deal's termination will not trigger a new wave of migrants coming from Turkey, because a dictatorship cannot live with open borders. The short to mid-term perspective is gloomy indeed. The country is set for an authoritarian and personalised presidential system that will destroy the country's economic, political and social potential. This is a grave moment of world historical importance, where the (albeit weak and contested) democratic path dependence of a pivotal country is about to be aborted. If the EU and its institutions continue their policy of non-engagement, while watching Turkey on the road to self-destruction and state failure, one may wonder whether the EU ever again will play any decisive role, not in world politics, but in helping to reduce conflict in its immediate neighbourhood. If it fails to do so, then what doe we need the EU for? Many Europeans may not be too concerned about Turkey’s democracy. Some in the populist right may even rejoice at Turkey's rapid self-destruction, as it also destroys the possibility of the country's eventual EU membership. Yet, the European Union should know better. Authoritarianism, civil war and state failure in Turkey will not be limited to Anatolia. It will take place in the cities of Europe, in the Turkish communities in Germany and France, Austria and Netherlands and on the Union's immediate borders. Even a security-minded Europeanist unsympathetic towards Turkey's (former) European aspirations would see that it is in the EU's urgent interest to avoid this horror scenario. The European Union is in a deep crisis. If it fails to help Turkey return to a minimum of rule and law, and if civil war in Turkey shifts from a looming possibility to reality, then this crisis will deepen and radicalise. Unfortunately, what the EU can do and what it is willing to do with regards to Turkey’s regime change are not the same. The EU seems to be too divided to come up with a joint response to Turkey’s crisis, much less to effectively respond to the threats of xenophobia and racism that target migrants, refugees and liberal values in Europe. Brussels' promotion of ‘normative power’ in the last decade was a sweet dream. Now, it is high time to reclaim this dream and make it credible.